Fly over the brightest city in the world, past Stratosphere Tower, Caesars Palace and hope for a glimpse of the Bellagio's fountains before spotting the skyline of New York-New York and the beam atop the Luxor pyramid. From the air is the only way to experience the beauty of the Las Vegas strip in all of its shimmering glory. Whether you call it “the City of Entertainment, “Sin City” or “the City of Lights,” there’s only ONE way to see the best that Las Vegas has to offer…from the sky with Maverick Helicopters! Get ready to witness the Best-of-the-West as your excursion begins with a journey past Lake Las Vegas, an exclusive golf resort consisting of numerous celebrity homes and hotels. Next, visit Lake Mead to see one of the largest man-made lakes in the world. 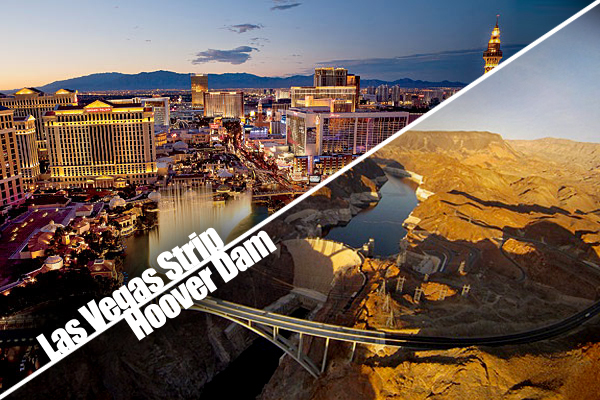 Get your camera ready for a once-in-a-lifetime view of the Hoover Dam from above this national landmark. Conclude your air-only excursion with intimate, sunset views of the Strip's mega resorts and hotels including iconic landmarks such as the Bellagio, Caesars Palace, Stratosphere Tower, Luxor, Eiffel Tower and historic downtown.